Whether you live in a high-rise apartment or on a 40-acre spread, we've got you covered in the compost department. Why can’t I just build a pile on the ground, you ask? Well, you certainly can. But social graces, at least in urban areas, dictate that we conceal our compost (not everyone wants to see it or smell it). A bin also keeps dogs and raccoons from spreading compost across the yard. And modern bins have all sorts of bells and whistles that make it a little easier convert your kitchen waste to plant food. We’ve divided up the options based on different living situations. When you’re short on space, a worm bin is the way to go. This is essentially a container the size of a suitcase (plastic storage bins are often used for DIY worms bins) that houses thousands of wriggling red composting worms that eat your food scraps, along with the diet of shredded newspaper. You can keep the bin on a balcony, patio, or deck (out of direct sun is best), or indoors in a kitchen cabinet or utility closet. Heck, you can even stick it in the corner of the living room – some pre-fab worm bins are designed to look like a chic piece of furniture. (Don’t worry, the worms can’t escape into your home.) And when functioning properly, the bins are virtually odorless. It’s also easy enough to make your own worm bin – we tell you exactly how here – but there are a variety of designs available at garden centers and online suppliers if you’re looking for a ready-made solution. Most store-bought models are designed with stackable layers that keep fresh kitchen waste, where the worms like to hang out, separate from the finished compost – technically known as “worm castings” (aka worm poo) – making it much easier to collect and use. They also come with a spigot at the bottom to collect “compost tea” – perfect for houseplants. You’ll probably find one of the standard plastic worm bins at your local garden center, but more attractive wooden versions are available online. If your worm bin doesn’t come with worms, you can buy them by the pound online and have them shipped to your doorstep. The Downside: It takes a bit of TLC to keep the worms happy. You need to monitor conditions in the bin regularly, so if you travel a lot, this may not be the best option for you. We recommend a compost tumbler for small yards. They are self-contained, keeping the critters out and the compost area tidy. The rotating drum keeps the compost inside well-aerated, which helps to reduce odor and accelerates the conversion of kitchen scraps to black gold. 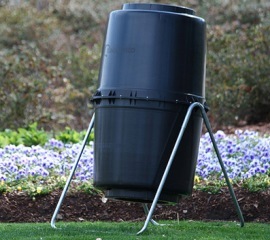 Compost tumblers come in various sizes; choose one that matches your family size. Many have gears that make it easier to turn the tumbler. Beware tumblers in which the bin is mounted vertically, as these are very difficult to turn when full. Put the tumbler in a shady, out of the way spot in your yard. You’ll need a supply of leaves, straw, grass clippings, or other sources of organic matter on hand to throw into the tumbler every time you add kitchen scraps. A cylindrical container out made with 36” wire fencing is an easy way to keep these materials contained. The Downside: For their size, tumblers are typically more expensive than compost bins designed to sit on the ground. And with a relatively small opening on the side of the bin, harvesting finished compost from a tumbler is a bit awkward. If you’re not short on space, we suggest a three-bin system. The idea here is to build your pile on the ground with walls on the sides to keep the contents from spilling out. With this approach, it’s much easier to turn the compost (with a pitchfork or a special compost turning tool) – helpful for aeration – and to harvest the finished product. 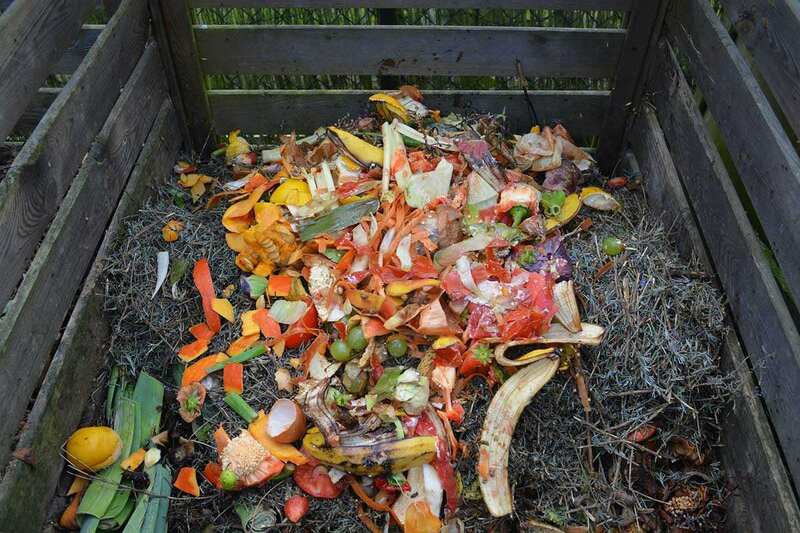 Having three bins gives plenty of space to store extra leaves and other compost materials, and allows you to have multiple piles going at once – which especially helpful if you have large quantities of kitchen waste, garden scraps, or even litter from a backyard chicken coop to compost. Once one bin is full, start a new pile in the next bin while the original pile continues to decompose. For a DIY approach, check out our step-by-step instructions for building a three-bin system with used pallets. There are also plenty of pre-fab options available from garden supply companies, including wire mesh models and beautiful cedar bins. The Downside: Being open to the air, odors may be an issue with the three-bin approach (check out our Secrets to Perfect Compost guide for tips on how to prevent foul smells). Critters can also be an issue. To keep out dogs and raccoons, simply lay a piece of wire mesh, cut to the size of the bin, on top of the pile.